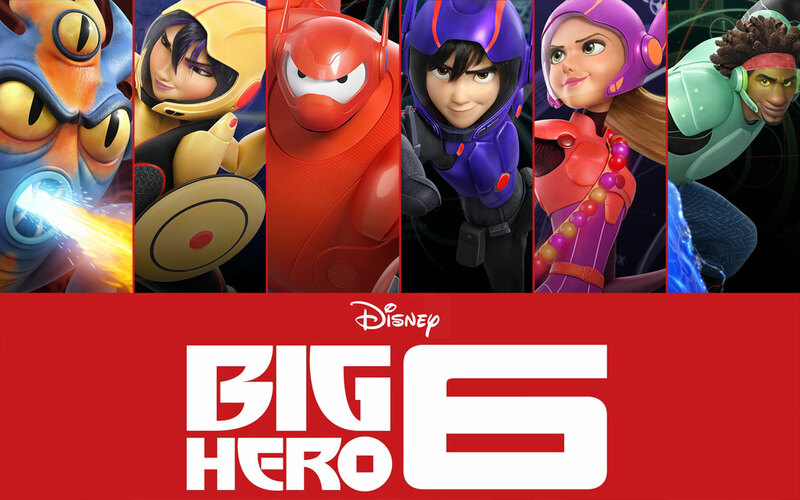 Quickfire Review: Big Hero 6 (2015) – Hooray For Movies!! Big Hero 6 is the most Pixar animated movie that Disney have made so far without the associated kudos of their sister companies high watermark brand name. Set in the gorgeously realised hybrid city of San Fransokyo, a glorious vision of West Coast easy going landscapes melded with traditional Japanese culture and deep seated ambition, Big Hero 6 is Disney’s latest movie about dealing with loss, aimed at the Marvel Generation. Big Hero 6 refers not to the squeezably adorable, deadpan healthcare companion Baymax as the early trailers may have had you think. Rather, it is the name of an unlikely band of super nerds turned super heroes led by a young genius Hiro (Ryan Potter) who is burning for revenge following an unspeakable tragedy. Thanks to their combined talents for developing future technologies, Hiro combines the individual geniuses of his science geek friends to fight an evil supervillain sporting a sinister Kabuki mask. The aforementioned Baymax, a placid health monitoring robot/Pilsbury Doughboy developed by Hiro’s older brother Tadashi (Daniel Henney), inserts himself into Hiro’s life in a bid to heal his emotional wounds. When Hiro realises his ragtag band of super geeks aren’t enough to win his battles, he hacks Baymax from cuddly friend to fighting machine. It lacks the consistent big laughs that other recent pop culture heavy cartoons like The Lego Movie had, but it more than makes up for it with heart and beauty. Scott Adsit, who is best known for his role as pudgy producer Pete Hornberger in 30 Rock, gives Baymax a leveling soul to the otherwise frenetic chaos. When he is required to pull comedy punches it is generally Baymax who gets the best scenes, not least when he acts like a giant drunken baby when his batteries run low. Like all great Disney films Big Hero 6 is about introducing children to themes of loss and forgiveness, but in a way that never feels preachy or unnecessarily sentimental. It’s still not quite up there with Up or Wall.E in that regard, both of which still make me cry. But it is another fine cartoon adventure that will undoubtedly spawn at least one more in the franchise. Good review. It’s a lot of fun, but honestly, it works so well because of Baymax. He rules.